For the last more than a decade, the Atlanta Botanical Garden has been nothing but growth, and I'm not just talking about the plants. But that's not what I wanted to share right now. Tonight, I'm feeling a little nostalgic. "Stillness and Growth" is a Georgia White Marble sculpture that used to adorn the main entrance to the Atlanta Botanical Garden. The sculpture is still in the same place...but the entrance moved a few years back. Fortunately, there are a couple of places from within the Garden where you can still enjoy this remarkable work of art. The eight-foot sculpture was carved onsite by Paul Popple of Florence, Italy, and donated to the Garden by sisters Mary Goddard Pickens and Elkin Goddard Alston in memory of their grandmother, Mary Ruse Nicolson and their mother, Mary Nicolson Goddard. Want to catch a glimpse of this beauty? You can see it from the Perennial Garden, as well as from mid-point crossing Flower Bridge leading to the two-acre Children's Garden. 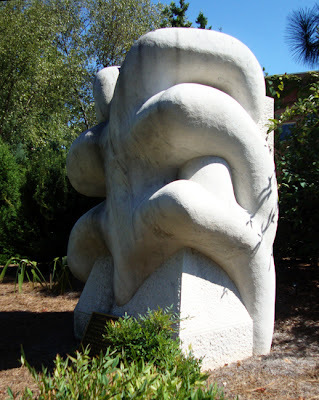 I always loved this piece and it's been a part of the Garden since 1986, the year before I started visiting. I hope it'll always be part of the Atlanta Botanical Garden...and who knows, maybe it'll eventually find a new home in a more visible place in the Garden one day. No, no, I've not heard anything...just wishful thinking.